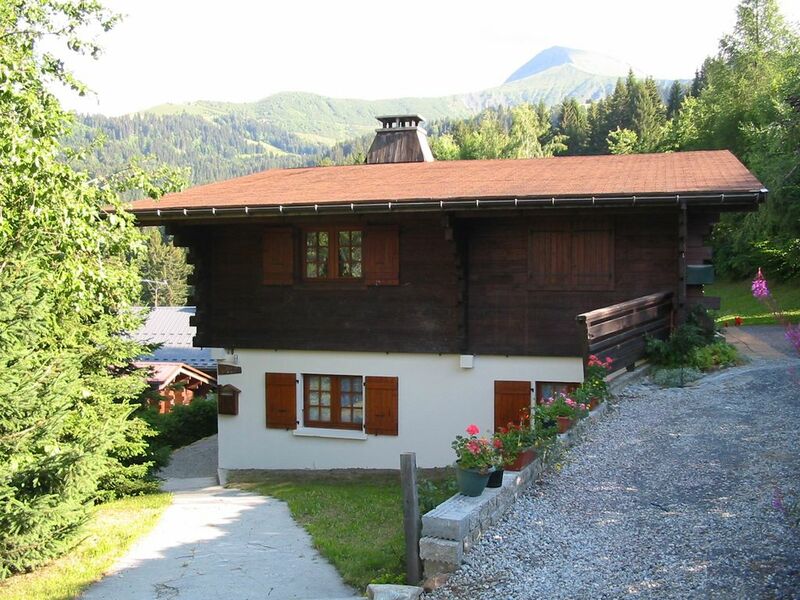 A spacious ground floor chalet apartment with magnificent views overlooking Mt Blanc. The chalet is well appointed and comfortably furnished with a feature log fireplace. Le Grattague is approximately 1.5 kms from the ski station at Le Bettex and the chalet is just 100m from the ski bus. Tennis courts and a swimming pool are available in summer. Easy parking. Chalet details: This delightful chalet is set in the small peaceful hamlet of Le Grattague. It can sleep 8 people but is more comfortable with 6 or 7. The apartment comprises the ground floor of a two storey chalet and has 2 bedrooms, a spacious lounge/dining/kitchen room together with a bathroom and separate WC. The total floor area is some 62m2. The apartment is well furnished with two easy chairs, one double sofa bed and one twin sofa bed in the lounge area which also has a feature fire place. The kitchen diner is well equipped with large dining table (6 seats) and dresser. The kitchen has full hob, oven, fridge, dishwasher and microwave oven. A small washing machine is also available in the bathroom. The main bedroom has a double bed whilst the second bedroom is equipped with two bunks beds, plus drawer bed, and one single bed. Summer details: Le Grattague has its own swimming pool and tennis courts for use of residents. This is a superb walking area and golf, mountain biking, horse riding and para gliding amongst other activities are available locally. The resorts of Megeve and Chamonix are easily accessible by car where there are summer luge runs which are great fun for children (and adults). Rafting is also available. Note that the chalet does contain sufficient sleeping facilities for up to 8 persons. However this would be more than we would recommend. It would be comfortable sleeping 6-7 people. A very comfortable stay in a well equipped chalet. Beautiful views of Mont Blanc from the chalet and some lovely walks in the area. Overall a very enjoyable stay. Chalet Heliodore is in a beautiful location with spectacular views of Mont Blanc, This was my second visit and I had another wonderful holiday in the French Alps. The chalet is well-maintained, very clean and well equipped. St Gervais les Bains is a pretty village with a variety of shops and restaurants. The annual local market is well worth a visit if you get the opportunity. For a good meal at a reasonable price, Chalet Remy near Le Bettex is a quaint restaurant within a five minute drive. There are some beautiful walks within easy reach of the chalet and lots of lovely places to visit by car. All suggestions should be considered and you will be spoilt for choice! This chalet is definitely to be recommended! For a family of 2 adults and 2 kids (aged 11 and 9) this made a very comfortable place to stay in summer. Unfortunately the weather was not great the week we went in August so we were not able to do as many hikes as we had hoped, but we did see the fantastic views of Mt Blanc from the chalet including a great sunset. The chalet is roomy enough and well-equipped for rainy days too with TV/DVD player, ipod dock, games and puzzles. The kitchen is good with English things like a kettle and toaster. The bedrooms are fine; the second one has bunk beds and 1 single. Everything seemed clean and well-maintained and the swimming pool with views of the mountains was great and also well-kept. The road up to Le Grattague is fine in summer even in an English car. you can get bread and milk and emergency items in nearby Le Bettex; other shopping is easy to do in St Gervais (Casino) or Le Fayet (hypermarches). However, St Gervais is a bottle-neck and can be slow to get through especially at lunchtimes and the early evening - at least it was in August. The car park by the TMB station gets very full too but there is a free multistorey a short distance away in the centre of town on the way from the chalet. The visitors book has various suggestions for restaurants but one of the closer ones was closed when we were there. We did go to Chalet Remy near Le Bettex which was a very friendly and cosy place that does fondues and raclette but other food too. Overall we thought Chalet Helidore was a well located and good value for money base for a summer holiday in the alps and we would definitely go there again. Nous avons passé un excellent séjour dans ce chalet avec vue sur le Mont Blanc. Le descriptif correspond bien aux prestations. La navette pour rejoindre les pistes est à 50 mètres du chalet cela permet d’y être en moins de 15min. L’echange avec les propriétaires était parfait. Nous recommandons. Merci bien pour votre revue. Je suis contente que vous avez passe un excellent sejour au chalet et vous seriez toujours le bienvenu pour retourner. Viv. Chalet spacieux, fidèle à la description sauf en ce qui concerne les lits pour enfants: un lit pour enfant non fonctionnel (sommier cassé et matelas trop grand pour le lit). Parking aisé. Véhicule nécessaire pour l'accès aux pistes. Je vous remercie de votre revue. Désolée que le sommier ait été casse. En fait j’ai acheté un nouveau lit gigogne pour installation cet automne. The chalet is situated above the St Gervais /Les Contamines valley looking directly across to Mont Blanc. Whilst in a peaceful area high up on the mountain, it is still only one hours drive from Geneva Airport. Ski: Le Grattague is a small holiday hamlet which has very easy access to the St Gervais - Megeve ski area providing over 350kms of pistes. It is a very peaceful area at an elevation of about 1300m and although it is easily accessible, a car is essential. There is a large telecabine, two chairlifts and tows at Le Bettex which is 1.5km away. The ski bus stops approx 100 m from the chalet. Slightly closer is a ski tow at Les Communailles which is approximately 1 km away although practically Le Bettex is easier. The skiing is suitable for all abilities with a number of green and blue runs and some more challenging reds and blacks for the more experienced skiers.